Thinking about buying Instagram followers to help make your page look better and more popular? Before you do, read this article. The thought of buying fake Instagram followers can feel awfully tempting. Everyone is striving to get more Instagram followers, but growing them demands a lot of time and effort. This is the thoughts that many people using Instagram have had, and many of them have landed on the decision to buy fake Instagram followers. But unfortunately, the instant gratification mentality and the temptation of seeming more popular has been so convincing that they haven’t considered the reasons why you shouldn’t buy fake Instagram followers. And let me tell you, there are plenty. There are many reasons why you shouldn’t buy fake Instagram followers, and that’s what I’ll go through today. The fact of the matter is that there are more reasons why you shouldn’t buy fake followers on Instagram than there are reasons to buy them, but when you’re only looking at the short-term, it’s easy to understand why buying Instagram followers can seem tempting. In this article, I’ll be giving you the reasons to Why You Shouldn’t Buy Fake Instagram Followers As An Investment. It’s easy to understand why buying fake followers has become so mainstream in today’s Instagram world. I’m not sure if you know, but I promise you that more people than you think have bought fake Instagram followers at least once. Some might just have bought a few to try it, some might buy fake followers regularly, and others might have built their whole Instagram image of popularity solely on fake followers. In other words, they’ve built up a fake facade of influence and popularity which is nothing but a lie. Buying fake followers on Instagram has become cheaper than ever as the supply of them has increased dramatically. Today, fake Instagram followers are a commodity, and with commodities, there are competitors, and with the big supply of fake followers, it has lead to a bigger competition among the companies who sell this service. Today, it is possible to get, within a matter of a few hours, thousands of followers that will make you look popular, influential on Instagram, and strengthen your Instagram presence. Or not quite….While the first part is true, the second part about strengthening your Instagram presence is nothing but an illusion. Something that is only perceived to be something, but in reality, it’s nothing but fairy dust. Let’s look at how cheap buying fake followers really are. Especially if you consider the fact that some of the influencers and individuals you look up to on Instagram probably have 50K followers or less, and you see them as huge influential individuals. With just 249 dollars, you can look just as influential as them – on the surface. Crazy, right? Let’s look at another service. $39.99 for 5000. Not bad either! There are different types of psychologies ot buying fake followers on Instagram. Firstly, there are the people who don’t really care about fame, popularity, etc. They just want a lot of followers so they can brag before their friends. Apart from the fact that buying Instagram followers costs money, these individuals often just try buying a few followers some time, and this doesn’t matter too much, nor for themselves or anyone else. The biggest ”problem” are the individuals who buy fake Instagram followers and have a commercial agenda, and hopes that buying the fake followers will lead to benefits. But before you buy Fake Instagram followers, keep in mind that social media platforms pay attention to drastic changes in your following amount. Sure, you can rapidly increase your followers in authentic ways as well, for example getting a shoutout from a celebrity, or being featured in the press, but for Instagram, it’s not that hard to see if a drastic increase in followers was caused by purchasing fake followers, or in an authentic way. They just need to look at the accounts that started following you, and they’ll quickly see that something is wrong. If Instagram catches you buying fake followers, you’ll get your account shut down permanently. In other rowers, they’ll ban you And they might not just ban your account but your IP address as well, preventing you from using or creating new accounts from that IP address. If you are lucky, they might just decide to temporarily ban you, however, the most common punishment for breaking Instagram’s Terms & Conditions when it comes to buying fake followers is a permanent ban. And remember, when you buy fake Instagram followers, that’s exactly what you do: you break Instagram’s rules. Buying fake followers is against their rules, and this is not very surprising, really. First of all, the services that sell fake Instagram followers use programs to create countless and countless of fake Instagram accounts – empty shells which they sell as followers. Of course, Instagram doesn’t want their platform to be full of bots and fake account, but they want their user base to consist of real people. Second of all, when people buy followers, they are cheating, and they are inflating numbers which just aren’t real. In 2014, Instagram put down major efforts to get rid of the fake accounts and bots on the platform. At that time, everyone knew that there were plenty of bots infesting the platform, but just how many, nobody really knew. Until the Instagram bot purge took place, that is. Overnight, millions of Instagram accounts disappeared, dramatically decreasing a lot of users’ follower counts. Of course, having a few fake followers is inevitable if you have a public account since the fake accounts also follow regular accounts to look more authentic, but the true identity of literally thousands of fakers was revealed after the purge. The purge exposed the people buying fake followers and put them in a position they wish they would never be in. Some people even went from several million followers to just a few thousand left. Imagine the embarrassment. They where shamed since it was so obvious that they were trying to make themselves look much more popular than they actually were, and as for the biggest celebrities who got busted, people were joking about them and creating memes. Instagram’s official account lost close to 30% of its followers – equivalent to 18.9 million. Justin Bieber lost 3.5 million followers and Kim Kardashian lost 1.3 million. Worst of all, hip-hop star Akon lost more than half almost 56% of his Instagram audience. 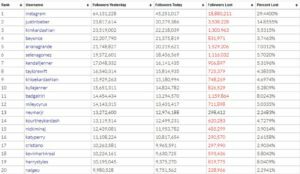 Just look at how many followers the top Instagram celebrities lost after the purge. I can promise you, when the next Instagram purge comes (and it will), having bought the majority of followers is not a situation you want to be in because as a result, you’ll lose a tremendous amount of respect in people’s eyes. If you fake your popularity, what else do you fake? If you become busted for having bought a bunch of followers, you’ll lose an immense amount of respect, because it says something about your personality, it sends signals that you are fake, since obviously, your popularity on Instagram was. The argument we hear from people who buy fake followers is that it works like a boost. By having a popular page (at least by the looks of it), you’ll attract more people organically. Sure, more followers can help, for example, a blogger to build their image and make it look like they are more influential than they really are, but the problem is that this will show in the long run in many different ways. Mainly on the engagement. As a result, it will just end up harming you more than you benefit from it. Fortunately, the vast majority of influencers and other popular individuals are people who have built their followings authentically, and if these people have been able to grow their popularity on Instagram organically, you can too. Don’t take the shortcut, because taking shortcuts will get you to the place where you don’t want to be much quicker. Whether that is to Instagram’s list of banned accounts, or being shamed, only time will tell. Let’s be honest, people with fake followers don’t have any real influence over people. Their high follower count is a deceiving metric that more and more brands who work with influencers have learned to take with a large grain of salt. The result of the increased fake followers buying, and the increased knowledge about this issue is that brands that are looking for new ambassadors and marketing pages have become more careful when choosing influencers to work with. The influencer industry has exploded in the last couple of years due to the large access to social media platforms, and with that, a lot of people who aspire to be influential individuals have decided to take the shortcut to inflate their popularity so they can play in the big league. But with the increased purchase of fake Instagram followers, brands have become more careful in who they partner with, and that’s also the reason to why we founded Veloce influencer Network. All influencers are carefully hand-picked to that brands and marketers don’t have to be afraid of working with influencers who won’t generate any real marketing results, because the reality is that no one sees their posts. This is obviously not strange by any means because their followers are bots! The big problem here is that if you get brand partnerships and get paid for promoting brands and products, and are then exposed for buying fake Instagram followers, these brands may demand their money back, because if you think about it, buying followers on Instagram and then selling promotion to brands is in fact a scam, because you create an illusion that you have something that you, in fact, don’t have, which is popularity. Buying fake followers, pretending you have influence over people, and selling it to brands means selling something you don’t actually have, and this can have enormous consequences if the brands find out, and considering how easy to is to identify the accounts that buy fake followers, they will eventually find out. What has become more and more important on Instagram over the years is engagement. At the same time, what has become less important is the number of followers you have. The reason is first and foremost that the number in your profile of the people who follow you doesn’t say a lot. It tells a rough estimate of how many people you, in theory, have the possibility of reaching, but it is far from a guarantee of how many people you’ll actually reach. Also, with the ever decreasing organic reach on Instagram, the number of people you reach with your post is decreasing. This means that the number which is in your profile isn’t as relevant as it once was, because what is interesting is the people you can actually reach, because this is the whole reason you have followers in the first place. If you have a bunch of followers but can only reach a fraction of these people with your posts, what’s the point? It’s a lot better to have a small, engaged following than it is to have an enormous following consisting of people who couldn’t care less about your posts, nor never engage with them. This is especially important if you’re aspiring to be an influencer and partner with brands. Obviously, the reasons why brands work with social media influencers is that they have the attention of their target audience. These brands are looking to leverage this and get the influencers to reach out to their target audience, in other words, use the influencer as amplification for their message. What this means is that the brands only care about how many people you can reach. They don’t care if you have 100K followers but can only reach one person. A problem, however, is that the result of buying fake followers is low engagement. All the bots do is start following you then never like a post of yours. Obviously, if you buy thousands or even tens of thousands of followers, your follower count will increase, but your engagement will remain the same, leading to an obvious sign of you having bought fake followers. Many brands have learned this and are constantly checking the pages of the people they plan to partner with to make sure that the pages have a reasonable amount of engagement relative to its followings before starting a cooperation. Also, it’s not just brands who look at your engagement. Everyone does. In fact, when I’m using Instagram, I compare their followers with their likes, almost out of habit. The result is that there is not much that surprises me anymore. I’ve literally seen it all! 80K followers and an average of 100 likes per post – you betcha! 200K followers and 250 likes? Absolutely! For me, it’s so obvious that these accounts have bought fake followers that I feel sorry for the accounts who have tried to fake their popularity but instead ended up harming their page, reputation, and brand. Social media is called social for a reason. You want to build a community of engaged people within your industry which you can engage and interact with, build a relationship with, and have conversations with, but when you buy fake Instagram followers, you can’t do any of that because your followers will consist of bots. You are using Instagram to reach people, right, and the problem is that if you have a ton of followers but reach virtually no-one with your posts, how fun is that, really? You’ll stop seeing the point of using Instagram, and the joy of using it will be lost. As I’ve talked about earlier, it’s not hard to identify the accounts that buy fake followers on Instagram. It doesn’t take an expert to see which accounts have bought and is buying fake Instagram followers. When you do this, you destroy your reputation and lose credibility. There are many ways people can find out that you’ve bought fake followers on Instagram, for example, the purge, which I spoke about earlier, but since it’s not that hard to see who has bought fake followers just by looking at their engagement, people don’t have to wait for the next purge to come just to see who’s fake and who’s not. Buying followers and inflating your following count to look more popular might seem like a good idea and make you feel good, but when people find out that it’s all a lie, it won’t feel as good, I promise you. What is a shadow ban on Instagram? We have seen it before on Reddit where moderators of subreddits got the power to mute users who didn’t contribute to the site in a constructive way. Basically, the idea behind a shadow ban is to silence spam accounts such as trolls, bots and people starting fights. But what does it mean on Instagram? A Shadowban on Instagram means limiting your reach outside of your followers. In short, blocking you from reaching accounts that aren’t following you, completely stopping you from growing organically. Previously, hashtags were the most effective tool for reaching non-followers of you, but now, it is reported that those who are shadow banned disappears from hashtags. Also whenever a friend of yours like your post, their friends won’t see this in notifications. You can read what more can happen if you get shadow banned, how to find out if you are shadow banned and what you can do about it. 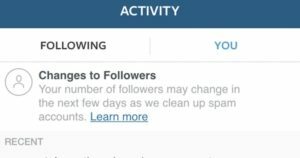 Spam-like behavior and bot-buying will get your account shadow banned, and this will further decrease your ability to reach people on Instagram, and make it even harder for you to succeed. If you are a person who’d like to increase your influence and become a popular figure, you probably also want to start partnerships with brands, become brand ambassador etc. If you would, despite the fact that you have bought fake followers start a collaboration with a brand, there’s a very high likelihood of you not being able to deliver what you promise to them if you have bought fake Instagram followers. If you, for example, promise to help a brand with getting sign-ups for a contest and have 30,000 followers, getting 50 people to sign up for a competition might seem like an easy task. But in reality, it might not be reached at all thanks to all the fake followers you have. Instead, you might end up disappointing the brand, and if you cannot live up to their expectations, they won’t work with you again. The big reason why you shouldn’t buy fake Instagram followers as an investment is that you’ll over time lose followers. Instagram has actively banning fake accounts and bots, right? And the follower you get when you buy followers on Instagram is nothing but that – fake accounts and bots. It means that over time, the fake accounts you’ve acquired as followers will become banned, and as they become banned, you’ll continuingly lose followers. Sure, buying followers might seem cheap because it doesn’t cost a lot, but the catch is that since you’ll lose followers over time, you’ll have to continuingly buy new ones, because losing followers is never a nice feeling, right? As such, while buying fake followers on Instagram once might seem cheap, you’ll have to repeatedly buy more followers over and over if you want to maintain or even grow your follower count because Instagram is banning bots on a regular basis. Many businesses are also buying fake Instagram followers. This is a huge mistake since doing so brings no real marketing benefits. If you were to ask businesses why they are using Instagram or social media as a whole, they’d answer that they are looking to drive marketing benefits from it. Some might say they are looking to improve their customer relationships, some might say that they want to reach a bigger audience, and some might say that they want to drive more sales. The problem? Buying fake Instagram followers helps with nothing of that. Since they aren’t real people, they will never buy from you, never engage with you in an authentic matter, never become loyal fans of your brand. None of it! Buying followers will only cost you and steal money that you could use in other ways that would be far more beneficial for your brand. 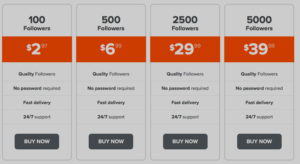 There are many services out there that claim that they sell ”real Instagram followers”, but this is nothing but bogus. There is no such thing as real followers that you can buy, and even if they were, they would still have zero interest in what you post nor interact with your posts or be affected by your Instagram marketing, because they follow seven thousand other accounts. Many people believe that buying fake Instagram followers is a good idea to increase popularity, look more established, and get more opportunities, but this couldn’t be further from the truth. There are so many reasons why you shouldn’t buy fake Instagram followers as an Investment and only a few reasons to actually buy them, with the main one being that you look popular. But wouldn’t you rather be popular for real instead of ”looking popular?”. By actually being popular and having an engaged and loyal followers, you can get marketing benefits. With fake followers, you can’t. At first thought, buying fake followers can seem like a good idea, especially in the increasingly competitive landscape on Instagram, but when you study it closer, it really isn’t a good idea. Nothing worth having comes easy, and since followers on Instagram come easy when you buy them, they aren’t worth having.